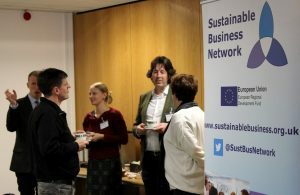 Delegates made their way to Chichester District Council bright and early for the Sustainable Business Partnership CIC’s Business Networking Breakfast. The event began with networking over pastries and coffee. Delegates from a variety of organisations attended, from all over Sussex. Louise Downey, of the SBP CIC, gave a short welcome to the event. After a quick round-the-round introduction from each delegate, it was time to hear from our expert speakers! First up, we heard from Bryan Van Namen of Light Foot LED. After a quick lesson on the science behind LEDs, Bryan spoke about the economic and environmental benefits they provide. Their lower power consumption means they can be up to 90% more efficient than traditional gas-based lights and emit a much lower level of CO2. On top of that, LEDs have longer life spans, require less maintenance, and have a greater output, meaning fewer LEDs can light up bigger areas. All of these advantages translate into substantial cost-savings too. Next, we had Mischa Hewitt from Earthwise, discussing the value of energy assessments. Mischa explained that these assessments follow 5-steps, which includes a review of an organisation’s premises, designing bespoke energy saving measures, and modelling the financial savings they’d achieve. Energy assessments can have a multitude of benefits, in addition to cost-savings. These include increasing staff and customer comfort, fulfilling legal obligations, as well as providing ‘green credentials’ which can be marketed by organisations. The event ended with more networking (and more pastries!). 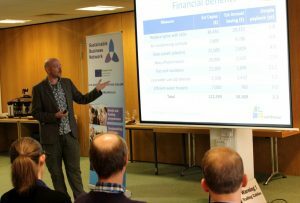 One popular talking point was funding opportunities across Sussex, such as the grants on offer through the SBP CIC’s Utilise Plus programme. 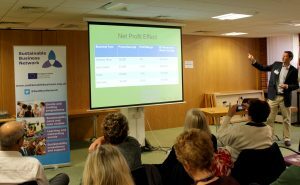 Amanda Geel, of the Coast to Capital Local Enterprise Partnership , said a few words about the funding and business support they offer, which a number of delegates had previously benefitted from and were keen to vouch for. At the Sustainable Business Partnership, we love hearing about exciting venues and passionate speakers who like to share their expertise. If you’d like to work with us, please get in touch.